The Kid-Sit is a universal sibling board with a seat for kids from approximately 18 months – 4 years (18 kg). Its smart design makes it easy to use and so much fun for your child to sit on. 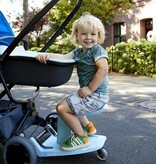 The Kid-Sit is attached to the rear axis by simple straps, and the seat can easily be slid and clicked onto the board. The board can be used without the seat as well. With the Kid-Sit behind your stroller, riding along is a delight! The Kid-Sit also fits many strollers without straight rear axle combined with the Kid-Sit Adapter ! Quickly do the pram check and see if it fits your stroller! 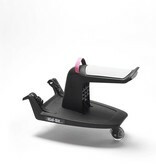 The Kid-Sit Adapter fits the Kid-Sit on many strollers without horizontal rear! Quickly put the stroller check! Loopie: Always a hand shortage? 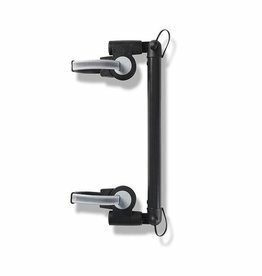 Attach this hand on the pram, stroller or shopping cart, and your baby has its own handle. The Kid-Sit is a universal board seat for children from ± 18 months to four years (18 kg). 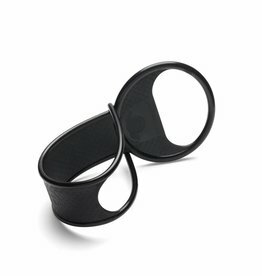 The Kid-Sit has a refreshing design, is easy to use and a pleasure to sit on!